Today’s Music Monday is really special – I feel honored to share it with you, friends. About a month ago, I posted about having guest musicians share on this blog and today is the first Brianna Branches Out post not written by Brianna ;). I’m going to ease back in with a short post, because once again, I had a hectic Monday coming off of a very busy week and weekend. Caleb and I spent Tuesday through Saturday in Malibu, California at the Pepperdine Bible Lectures. We were joined there by his parents, who made the week all the more special. All of us were physically, spiritually, and mentally encouraged by the lessons, worship, and fellowship we experienced. Last week I wrote about music being a community. This week I’d like to give you the opportunity to be a part of my Music Mondays community! Although I am still trying to find my voice as a writer and blogger, I would also love to share the thoughts and words of fellow artists. My stories are limited to my experiences, and I know there are so many other musical and artistic viewpoints out there! If you are interested in being featured on Brianna Branches Out one Monday and would like more information, please contact me at briannabranchesout@gmail.com with the subject line Music Mondays. I would love to hear and share your stories, insights, and talents! Yesterday I celebrated my “golden birthday,” turning 23 on the 23rd. Many people, including my mother, did not know what that meant, so I think it’s a recent development in birthdays. I don’t know if it was the title or the amazing outpouring of love I received, but I have to admit it was a pretty spectacular birthday! Thank you, friends and family, for making me feel so blessed. Once upon a time I started a blog in preparation for a group mission trip to Taiwan with two friends, one boyfriend (now husband! ), and one choir director. We met incredible people, sang some cool songs, visited beautiful parts of Taipei, and left a little bit different than how we began. It was an awesome experience, but blogging was more difficult to maintain than I thought and I haven’t posted since…woops. My life has changed in more ways than one since then, so I thought I’d do a quick catch-up blog and then start posting more regularly, as there are many things on my heart and mind that I’d love to share with anyone who is interested. SO here goes! I am overjoyed to announce that the man I have been blessed to call my boyfriend has become the man I get to call my fiancé and one day, my husband. 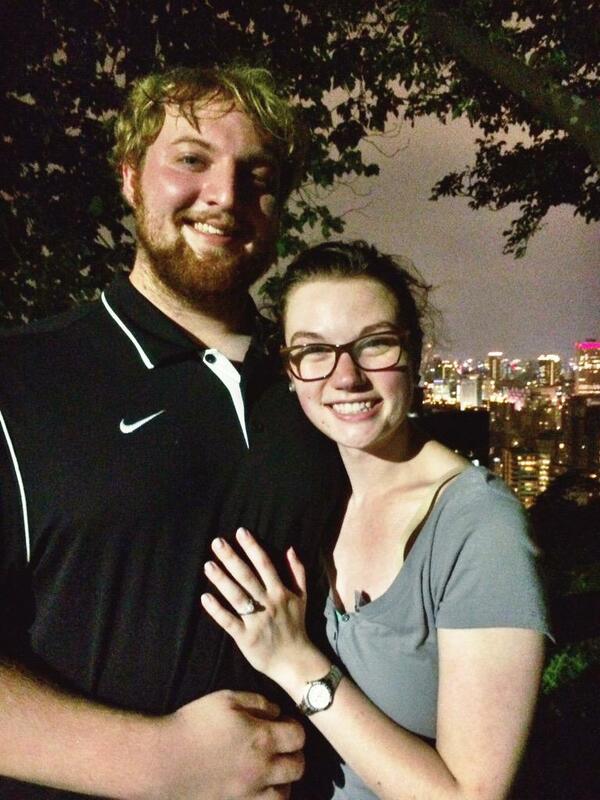 Caleb proposed on Elephant Mountain in Taiwan last night (this morning for you, America) with the lights of Taipei glowing in the background. He sang to me, accompanied by Nolan and Nicole, as all four of us simultaneously cried, laughed, and fought back nerves. I was not wearing anything special, my nails were not freshly painted (the picture below is a misrepresentation…), and I had sweat “glistening” on my skin thanks to the humidity and the hike. In our future, there will be lots of laughter and many tears of joy (with me, crying is a given). There will be friends and family surrounding us to support, mentor, love, and guide us. There will be (countless) instances in which my hair is not done and I’m not wearing any makeup, yet he calls me beautiful. There will be mountain-top highs and bright moments that twinkle like Taipei 101. There will most certainly be music. But there will also be moments of confusion, like when I asked, “Did you get down on one knee?” afterward, because I honestly couldn’t remember…hah! There will be moments of misunderstanding, like when I yelled, “We’re engaged!” at strangers who only spoke Chinese…There will be difficult times in our life together, like the struggle to walk up the mountain last night, and times where it might be too dark to see each other clearly. In all moments, especially the tough ones, I pray Caleb and I put God first in all we do and rely on Him for our strength. Our goal should be to do His will and always bring light to His glory. Through all things, I hope we will serve one another and put our own wishes last. And I know we can spend the rest of our lives actively choosing this love, never taking it for granted. I am thankful for Caleb and for all of the people who have influenced us, as a couple or individually, throughout our lives. I am thankful for whatever path or paths led us to this moment. I thank God for His steadfast love and the way He works through it. And I thank you for reading and for your love, thoughts, and prayers for Caleb and I!